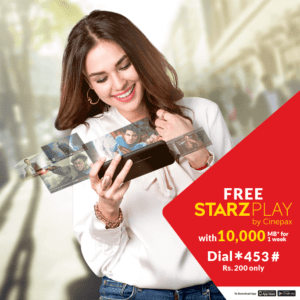 Watch Your Favorite Shows on Starzplay by Jazz Weekly Mega Plus Offer!!! Pakistan’s No. 1 data network with many new offers, packages and bundles is Jazz. It is the only network which always introduces some new and unique offers on hourly, weekly and monthly basis. This time Jazz bring a mega plus offer for all the prepaid Jazz Warid customers. The offer is Jazz Weekly Mega Plus which has 10000MBs of internet and free access to Starzplay by Cinepax for whole week. It is Pakistan’s premium movie and TV-show streaming platform in which there are over 6,000 hours of blockbuster content. You can also get 5,000MB (24 Hrs.) – 7 days and 5,000MB (2AM – 2PM) – 7 Days by dialing *453*2#. Jazz Weekly Mega Plus Offer is available in Rs.200/- for 7 days validity. Must read all the below mentioned details and subscribe for this mega offer for whole week. It’s really a great offer as you can enjoy your favorite entertainment shows on Starzplay by Cinepax on low rates. Now you have no need to worry about the weekly internet usage with high quality and on low rates. Because, now Jazz bring a mega offer for all its prepaid customers with 7 days validity. The Jazz Super 4G data users can enjoy the fastest internet speeds by Jazz Weekly Mega Plus. After its subscription you can get 10000MBs of data and one-week FREE ACCESS to Starzplay (by Cinepax). It is Pakistan’s premium movie and TV-show streaming platform with over 6,000 hours of blockbuster content. Just subscribe for this amazing offer and enter in the world of entertainment of your own choice. The internet speed will depend on multiple factors like SIM, device, web pages accessed, time of day, number of simultaneous users, distance from 2G/3G/4G site etc. Previous articlePayPal in Pakistan: A Reality-to-be?